Exciting News for F.D. Thomas, Inc. & D. Zelinsky & Sons, Inc.
Concord, Calif. (April 11, 2018) – ASRC Industrial Services (“AIS”), a premier provider of industrial and environmental services throughout the Continental United States, has announced the acquisition of F.D. Thomas, Inc. (“FDT”), a coating and specialty services contractor based in Central Point, Ore. and FDT’s wholly-owned subsidiary D. Zelinsky & Sons, Inc. (“DZ”), a San Francisco Bay Area-based commercial painting contractor. The companies will become part of AIS’s Construction, Maintenance and Repair (“CMR”) operating group. FDT, founded in 1979 and one of the nation’s largest specialty services contractors, performs commercial and industrial painting, waterproofing, roofing, infrastructure restoration and other specialty services. FDT has offices across the West Coast and provides expert service for major industrial facilities, commercial building owners, government agencies and entertainment/sports complexes. Since inception, the management and workforce of FDT have embraced the company’s value equation of Great People + Great Work = Extraordinary Company, in the process earning a reputation as a value-added service provider. 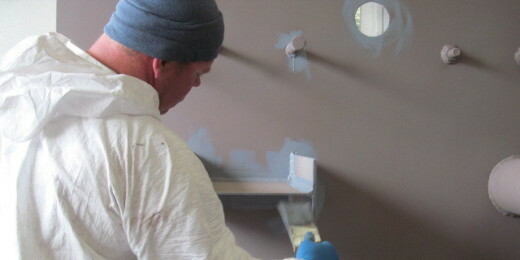 Founded in 1884, DZ has played a historic role in painting and decorating major construction projects in the Bay Area. FDT acquired DZ in 2014. The company provides high quality services including commercial painting, wallcovering, faux finishes, waterproofing, fireproofing, high performance coatings and SoftWalls™ upholstered wall and ceiling systems. AIS’s CMR operating group now totals seven companies. FDT and DZ join Petrochem, DACA Specialty Services, D2 Industrial Services, Omega and US Coatings. Headquartered in Concord, California, ASRC Industrial Services (“AIS”) is a wholly-owned subsidiary of Arctic Slope Regional Corporation (“ASRC”). AIS is organized within three capabilities-based operating groups: Construction, Maintenance and Repair; Remediation and Response Services; and Environmental Engineering and Professional Services. AIS has approximately 2,250 employees and operations throughout the Continental United States. AIS subsidiaries include Petrochem, RSI Entech, DACA Specialty Services, D2 Industrial Services, US Coatings, Mavo Systems, F.D. Thomas, D. Zelinsky & Sons, Omega and AIS Response Services. As a wholly-owned subsidiary of ASRC, AIS and its subsidiaries are considered minority business enterprises. Learn more about AIS at www.asrcindustrial.com. This entry was posted in news and events on April 11, 2018 by Terra Wells. FDT was mentioned in this article for the painting of the Broadway Bridge in Portland, OR. This entry was posted in news and events, Uncategorized on March 30, 2016 by Admin. This entry was posted in news and events, Uncategorized on February 17, 2016 by Admin. FDT has recently been awarded the subcontract for Specialty and High Performance Coatings at the National Bio and Agro-Defense Facility being built in Manhattan, Kansas. FDT is excited to join the McCarthy Mortenson team and will look forward to starting work in 2016/2017. This entry was posted in news and events, Uncategorized on February 2, 2016 by Admin. FDT crews continue with caulking at the metal panels and glass at the Golden 1 Center in Downtown Sacramento. As the below grade waterproofing was quickly wrapped up, FDT has now moved onto the above-grade waterproofing. Scopes of work now include Hot Fluid Applied waterproofing, and joint sealants on the metal panels and glazing. This entry was posted in news and events, Uncategorized on January 14, 2016 by Admin. FDT crews have recently completed the re-paint of one of Portland’s oldest spans, the Broadway Bridge. Check out the link for details. This entry was posted in news and events, Uncategorized on September 18, 2015 by Admin. City of Pomona’s Reservoir 5C is a 10 million gallon reservoir. The tank is comprised of four (4) interconnected chambers that have an interior baffle wall near the mid‐point of the chambers. The tank was constructed in 2003, but leak testing revealed the presence of numerous concrete cracks. Attempts to seal the cracks delayed placing Reservoir 5C in service until early 2004. The reservoir has never operated at full capacity since 2004 due to its significant water loss. The City of Pomona was seeking a Design‐Build strategy to rehabilitate Reservoir 5C that prevents moisture from continuing to permeate through the cracks in the walls of the tank and cause progressive deterioration of the reinforcement steel and decrease the structural integrity and life span of the reservoir. FDT will be working with Wiss, Janney, Elstner Associates, Inc. (WJE) as our engineer who will be writing the specifications under our direction. FDT will implement the work in the field along with West Coast Coating Consulting doing our field inspection for quality. The project engineering stage will start after NTP (August 20), and physical repairs to the reservoir is set to start the middle of October (2015). 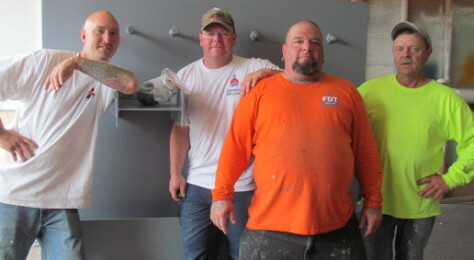 FDT employees; Don Stallsworth, Chris Stallsworth, Nate Chatfield, and Neal Morgavi recently completed USACE Painter Qualification Testing at our shop in Medford, OR. This testing was done in preparation for upcoming work at the Lookout Point Dam and is witnessed by a Government inspector. 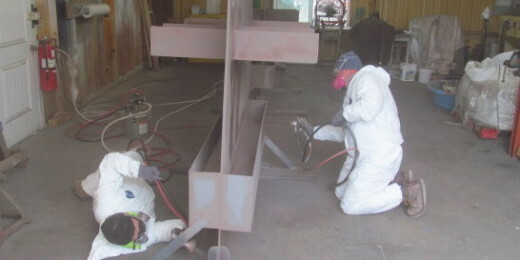 The process required application of Zinc Primer and Vinyl Paint for steel hydraulic structures. This entry was posted in news and events, Uncategorized on September 17, 2015 by Admin. Richland, WA — F.D. 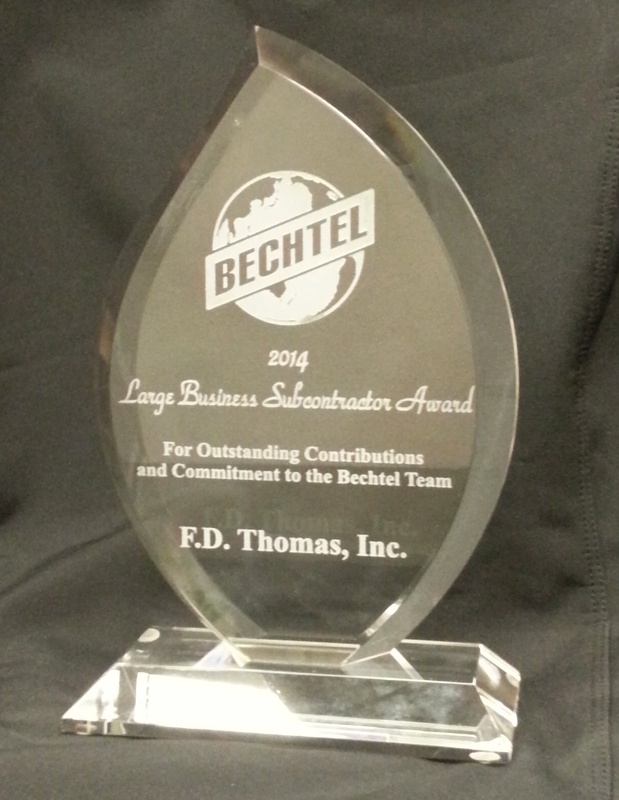 Thomas, Inc. was recognized for outstanding work on projects by Bechtel’s Nuclear, Security & Environmental global business unit at the Bechtel Subcontractor and Supplier Recognition awards. The awards recognize subcontractors and suppliers who supported Bechtel‘s work in nuclear power, environmental clean-up, defense, and nuclear security and operations projects during 2014. Great People + Great Work = Extraordinary Company. F.D. 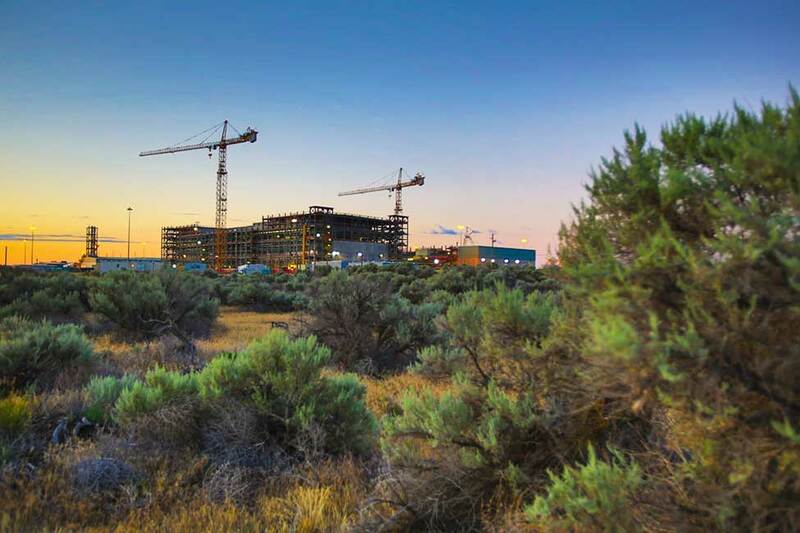 Thomas, Inc. was awarded the contract at the Hanford Waste Treatment and Immobilization Plan Project in Richland, WA in 2003. Our scope of work includes application of special protective coatings. This entry was posted in news and events, Uncategorized on May 19, 2015 by Admin. This entry was posted in news and events, Uncategorized on December 30, 2014 by Admin. Copyright © 2014–2018 FD Thomas, Incorporated.